This is a group of friends dealing with the challenges of having a significant amount of weight to lose and being fit which becomes harder after 40. If you're an old or new friend and not over 40 and feel this is the place to post, jump right in. Last edited by Terri in MO; 12-18-2005 at 06:33 PM. We're having our second snow of the season. It will only be about 3 inches. Rather unusual to have it so soon since we have had such dry winters overthe last few years. Kind of pretty especially since its Sunday and I don't have to make the commute to work. Geez, I just saw the weather forecast and it may be 60 degrees by next Friday. Sorry for being AWOL the last few days. Work has been so busy and I have been working later than usual trying to get done what needed to be done. Then by the time I get home, walk the dog, talk to DH, have dinner, then I'm too tired to get on the computer. And too, after spending all day on the computer at work, getting on it at home is the last thing I have wanted to do. We had our big Christmas gathering for my family yesterday. It was a good day. We had 22 and five were missing. Big group. We gathered at my snooty brother's house since he has a house big enough for all. We do an all day event for my family. We get there around 11 am and start eating the appetizers. Snack snack snack and then its time for dinner. I ate mostly veggies and fresh fruit so I didn't feel guilty for pigging out on those snacks. I only had three small Christmas cookies so I didn't pig out on those. Dinner was a reasonable plate and we didn't have that many side dishes. I did enjoy the desserts though. I cut the pieces in two and had a small piece of homemade chocolate cake and a piece of Italian cream cake. Supper was a piece of coconut cream pie that I brought home. That was it for the whole day. Could have been a lot worse and it used to be a lot worse foodwise. And I really have no interest in having more holiday food. I'm ready to be back on SBD type of eating. We do the Chinese gift exchange so that was fun especially with that big of a group. Other than small generic gifts to everyone, which we make optional, we don't exchange gifts. We do something special for mom. This year we're giving her a plane ticket to go spend some time with her sister in Arizona. We wrote in the card that its a one-way ticket! DH has lost 12 pounds since he started on Byetta. I am so relieved for him. It has really helped him cut down on how much he eats because he just isn't hungry. I've also been possessed reading Harry Potter. I finished the fifth book and have just started on the sixth. Then I'll be back on Janet Evanovich to finish up the Stephanie Plum series. Then I think it will be time to read a bunch of the horse books I have. Today is a good day to lay up and read. I had my metabolism measured last week. It is something I learned about from the diet software I purchased. There is a device that you breathe into and it tells what your resting metabolic rate is and you put that into the software to see how many calories you should eat. The doctor that administered it is a naturopathic doc. She was telling me that she found out here RMR was only 1100 calories which helped her prove she has a low thyroid function. Once she found that out, she was able to use the software and lose 25 pounds in two months. So mine was 1740 which she said was good and that tells me that I haven't killed my metabolism. So now my plan is to net 1650 calories a day. Which is roughly 29 WW points if going by that plan. I have been eating just enough over that to maintain and not lose. It was an interesting learning experience. DH and his mom have been fighting. She's 85 and widowed. We found a nice independent living facility that is reasonable money for the location, quality of living and level of caring. Its perfect for her. But she's been complaining about how much it costs her since about the 3rd month she lived there. She just isn't going to find anything cheaper that allows her that level of independence from us. She could go to an apartment but she would basically be a shut in unless someone else goes to take her anywhere and she wouldn't have the ability to leave her apartment to visit others without going outside. Well, she has mentioned moving into an apartment with her youngest son, he's 52. DH about flipped out. The youngest son is a flake and has been for years. He can't hold a normal job. He has no credit history and if anyone has a negative credit score, it would be him. She's given him a credit card so that he can charge food and "other stuff" and he's run it up to $7500. She claims he's been making the payments. She's paying for his cell phone bill. Two years ago, she allowed him to purchase a $30,000 truck in her name only and she doesn't even have a driver's license. When we asked how he got it, she'd only say, "I don't know". Now he's defaulting on the loan on the truck and has turned it into GMAC. Which means he can't work. She will have to make good with GMAC and she will have to be paying off the credit card. DH is beside himself with anger. At her for crying about how she can't afford to live there or buy her great-grandchildren $10 gifts for Christmas (there are FOUR) but she can throw away $17,000 approx on the son and lie about it. Its been really tense the last couple of weeks because we can't do anything to stop this. We'd have to take her to court to prove her incompetent and she isn't. Whenever we try to talk to her, she bulls up and cries and keeps saying, I don't know. But she doesn't have enough money to do this and still be able to live there - its definitely knocked two years off if not more. She could go tomorrow or she could live another 10 years. She needed that money so not to end up on Medicare before she physically needed to be in that kind of facility. But she insists on protecting that son. A whole lot of mother-son issues going on. She definitely is the one with issues. Leanne - I am so sorry that you did not get the PhD scholarship. I have to ditto what others have said, you are not a failure. You have not failed your children. You have shown them a mother that has gone after something and still raised her children - you've shown them a wonderful woman of strength. I will be praying for that miracle. Is a scholarship the only way to get started? 2Cute - I will be praying for your nephew as well. I hope the other issues work out for the good. How's the shopping for the grandbabies? I love doing that too but ours are all boys so no fun girl stuff. Now for the wrapping! Thin - Busy girl! What are you buying the boys this year for Christmas? How was the birthday party? I think we're doing a small gathering at our house tomorrow night for the neighbors. I like fun! We bought the Italian cream cake at Sam's club - heaven! I wussed out and bought the variety cheese cake instead of baking it myself this year. Their bakeries are darn good. Michelle - The tree sounds lovely. I do twisted garland of red, gold and green beads. I threw out the tinsel garland years ago. But not creative enough for ribbon. What's cool on Andrew's list this year? Lilion - That is so awesome about your co-worker leaving that note. Use that as inspiration to get your groove back. I would have cried. Maybe just by seeing what you've accomplished, she will do something positive for herself. Elaine - I'm sorry to hear about Marie's loss. Very hard at this time of the year. I'll be saying a prayer for her mom. How's single grandma going? Give Marie a big hug when she comes home. My dad died three years ago from an aortic anyeurism. We were all stunned because at Thanksgiving we had such a good time and then about two weeks later, he was suddenly gone. Ruth - The naturopathic doctor told me to "eat breakfast like a king, lunch like a lady, and dinner like a pauper". She said if you get started off with a protein loaded breakfast then you are far less likely to have hunger blowouts throughout the day. However her breakfasts are grilled salmon and sauteed swiss chard. But I think her point is true. Marge - The volunteering sounds like a rewarding experience. Do you know what you would be doing at the center? How's the baking? Because of work, I have done none and probably won't at this point. Unless I lose my mind later in the week. One thing about it, I don't have it in the house to chow down on. Actually, I was sitting here thinking about all the different cookies my sister had made and how I needed the recipes. Then I thought about making a family cookbook for next year's Christmas gift. OOOH, might be fun! Okay, hopefully I have replied to about everything on the last thread. I've been working on this for a long time. Better get it posted and move on to reading. We're off and running to the theatre again today. We got in last night after 2 AM!!! We decided we're getting far too old for those late nights/early mornings! We took a break from the theatre to attend my girlfriend's party and then had to leave at 10:00 to get back to the theatre and close up. We headed out of the theatre around midnight and went back to my friend's and visited while we helped her clean up. I told her that the next time her husband and kids threw a party FOR her, they should include clean up duty in the plans. Geez!!! The boys won't be getting much FUN stuff for Christmas this year. Only stuff like ladders, shop vacs and tools. BIG expenses with new houses and they have to get that stuff from somewhere. Actually, we did get the "baby" a leather jacket and a poker table. #1 Son will get a couple of DVD movies that he wanted. I also have some slacks and shirts put away that I bought on clearance through the months so Christmas will not be entirely a loss, but nothing really "fun" either. Leanne: I'm so sorry that the PhD scholarship did not work out. PLEASE do not think that you are not a GREAT mom. My goodness girl, you have struggled and overcome so much. Not getting this scholarship certainly isn't YOUR fault. Like the other girls have said, you are teaching your family about being strong, no matter what happens, and picking yourself right back up and moving on. That is a better lesson that any other you could possibly instill in them. I know I owe the rest of you, but I really do have to get out of here. I'll try and get back soon. Love ya bunches!!! Hey, somebody pick a new song.......please. Hello ladies, not much time to spend here, but I wanted to tell Leanne that I am so sorry things are not going well. I ditto what everyone else has said, you should not feel like a failure! You worked hard and had every reason to believe that you would move forward with your career. Your children will know that you tried to do what was best for all of you. Terri, it was good to see your post. Family, you gotta love them! (or maybe strangle them). I agree with what the naturopathic told you about eating protein for b'fast. I can tell a difference when I eat cereal, I get hungry before lunch. I think that is the reason I have been having the hungries around lunch time. ( Any excuse will do ). Leanne, I know from recent experience that it is hard not to feel like a failure when all you plans and hard work for the past few years have failed. When we had to close our business in Oct. OleAlvIin and I both felt like all our hard work, our hearts and soul, and most of all our life savings had gone for nothing. But life does go on, even though in a very different direction. Just hang in there. Terri, Just keep in mind you MIL is competent and even though she does not use her money in the most constructive ways, it is her money. As hard as it might be to watch her "throw" it away, it is her's. When oleAlvin's mother died, she left everything to his sister and Alvin had to go through some very hard time including a lot of feeling "unloved". Now his sister is basically dying and everything his parents worked so hard for all their lives will go to his drug-addicted 36y/o deadbeat nephew. Everyone else, I love you and would love to stay and chat, but I have to leave and go to the club and exercise. Be back tonight. Now is a time to focus on what we have to be grateful for. No matter how bad times can get... there is always someone out there worse off than youself. My nephew who is only 33 just found out he has cancer. They just had a baby 6 months ago or so ... and have an adopted daughter who is only 3. I'm so sorry to hear about that. And you are so right! No matter what the situation, there are always worse things that can happen and we all need to be able to think of the good in our lives and the positive things. Have a good time shopping for those grandbabies! Are there girls? How I wish I had little girls to buy for! Poor me...never able to visit the pink isle! Leanne: I can't help buy think about 2 Cute's quote in your situation. I am soooo sorry that your job and scholarship seems to have fallen through! But, as everyone else has said, you have done nothing wrong and you are NOT a failure! Life throws some awful curves at you, but I'm sure that you will find a way. You have so much going for you. Even if this one opportunity doesn't pan out, spending this time getting your education has not been a waste! I'm sure it will open other doors for you! Hang in there! Marge: Love the history of food website! I wish I'd known it sooner...I may have to incorporate some of that into my holiday feast this year! We actually were planning on goose for Xmas dinner, until I priced them! $3.50 a pound is the cheapest I found! I'm darned if I'll spend $35.00 on a bird I may not even like! So it's a new-world turkey for me...free!...since my best friend has two in her freezer right now and said she'd just give me one of those. Elmay: I'm so sorry about Marie's mom. Nothing harder, especially this time of year. Hope you aren't having too tough of a time being single grandma! He's a cutie! Michelle: Your tree sounds lovely! I've always wanted to do ribbon, but just never have for some reason. 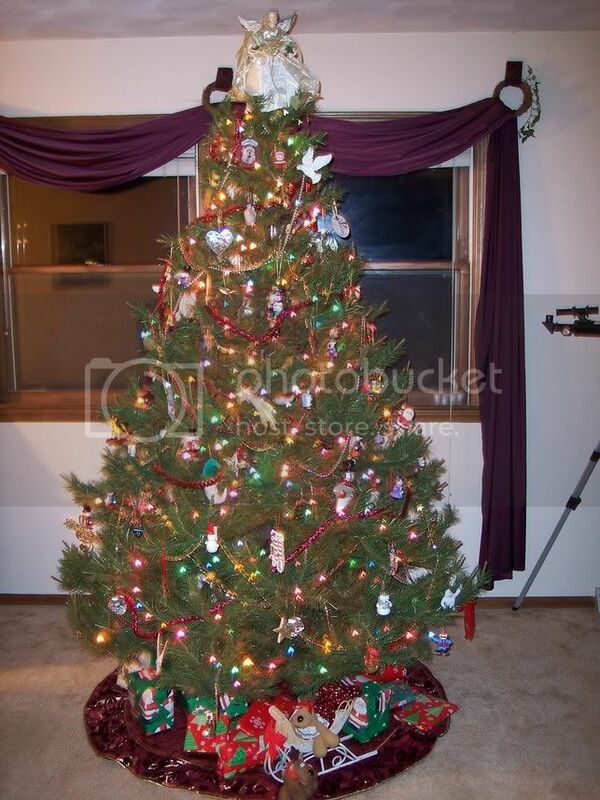 We should all post photos of our trees! (If I can figure out the new camera that is!) How old is Andrew? My DS is 10 and too old for Santa...but he's still trying to get me to admit "it". It's really funny watching him struggle with the knowlege that all of his friends say there's no Santa and me refusing to confirm it. He keeps trying to trip me up! But, I am the master of cover-ups! Terri: I heard there was more snow in KC but we got nothing! Suits me, but I wouldn't mind some for Xmas weekend. You did SO WELL at your family gathering! I just don't seem to be able to control myself in those party settings...it's pitiful! I'm thanking God that it's almost over and then I'll be able to get away from all the social eating. If I drank like I eat at these things I'd be the life of the party! A pity about the MIL money problems. I can see your point. She'll spend all her money on the dead-beat son and then your DH "the good son" will be the one footing the bill for her because she'll be out of money to live on. I wish I could give suggestions, but I'm afraid there aren't really any in this situation. Thin: Wow! Are you ever a busy lady! You know, I don't think I'd like that job much if I didn't at least get to see the darn movie for free! Head counting sounds like more work that I initially thought it would be. Did you get the book yet? Hope it got there okay. Well, the holidays and all the fat, fat, food is upon me! Mostly upon my hips! I had the SCA party Friday night and ate too much. Then had my best friends party Saturday night...and ate too much! But by the same token, I'm watching it all week and after Christmas I'll be ready to go and get back on track and losing again. NOT! That was the cake she wanted from Familyfun.com! After several hours of decorating horror, I ran to the grocery store and bought a cake! It was a big hit. The tree cake remains on my dining room table, 1/3 eaten at this point...it looks like crap, but tastes great. I'm going to try that darn cake again next year. I can see it looking really nice...but not using the directions they give you on that website. There is NO WAY the cake in that photo was decorated using those directions. You can't just dump glaze on a cake that's already stacked up and expect that nice finish to the frosting. If I do it again, I'll frost it like a regular layer cake! What a baking disaster! I am still buying Xmas gifts. DS has been a problem this year. Finally got him some dragons Mega Blocks toys, a travel DVD player, a DVD, some PS2 games, a printer for his computer and the big gift is putting him in karate lessons. He's been begging for years and I've always said no, but he'll have the uniform wrapped and under the tree. All in all, it was pretty pricey, but it doesn't look like all that much. He's been warned it's going to be a relatively slim Xmas, so... I just wrapped the gifts yesterday and still haven't quite finished shopping. Nothing like waiting until the last minute! Well, speaking of the last minute, I have a hearing in 20 that I haven't even looked at the file for, so I better go! Have a happy, healthy OP day! Wow Lilion... if you call that a "Slim Christmas" for one person then I want you to adopt me. Sounds like a GREAT Christmas to me. Sorry I have been gone so much... and still will be. But I think of everyone often. My nephew got more bad news. His cancer if very RARE .. and FAST GROWING. Please add him to any prayer list you know of. My heart just breaks for them. My sister's cancer is popping it's ugly head up again too. I have loved ones in marriage turmoil and that is so sad for their kids. I sure miss that concept of PEACE on Earth. I wish I had time to go find the words to our new Christmas song but sadly I don't. But I do remember.... "I Wish you a Merry Christmas, I wish you a Merry Christmas, I wish you a Merry Christmas and a Happy New Year." Ok, girls I finished the song I started, now somebody else pick one! Well, yesterday was the worst food day I've had since last February! I had nothing but various types of fried foods and bread yesterday. Started the day with cereal and fruit today. We'll see if we can't do better. I really have nothing to say, but wanted to share with my favorite ladies a picture of my Christmas tree! I wanted to do lyrics to "O' Christmas Tree" to make a theme post here...but I found three different versions on the internet, none of which were the one I learned as a child. Have a happy day Ladies! Trasit strike started today, it's pretty chaotic here in NY. I'm so, so, so lucky I work at home here in Brooklyn. Honestly, New Yorkers are tough birds, they'll walk miles in 25 degree weather, or hitch rides with strangers and laugh about it. (Well, some of them!) At Christmas time, too. When everyone is at their most stressed usually. And all those businesses that will lose out on the last minute shopping. Sheesh. This is bad. Terri, I feel for you with MIL situation. Rob's mom always favored his troubled brother too. I don't think it helps them to get that attention, just the opposite. Not good for anybody. If you like the Potter books you might enjoy Jonathan Strange & Mr. Norrell by Susanna Clark, it's long and a little slow in the action department, I loved it. The volunteer job consists of tutoring recent immigrants for their civil service exam. I'm interested in English as a Second Language teaching, and thought this might be a good way to learn more about it and get experience. I baked oatmeal cookies with dried cherries, and a pecan butter cookie, chocolate chips. I just sent a bunch to my boss so there aren't too many around here. I was thinking about making Rob some chocolate covered cherries with the chocolate chips I have left over, but there's already so many goodies here. We'll see. Leanne, everyone else has really said it well, hang in there. To get as far as you have you obviously are a person that finds solutions to whatever obstacles might come your way. thin, how did you like King Kong? I love action movies. Must be fun to be behind the scenes working on it. Barb, I skipped the gym this morning and I feel so guilty. Good for you sticking to it. I didn't sleep well last night and couldn't drag myself out of bed! Lilion, beautiful tree. For me, free turkey would win over pricey goose, ha. Glad you liked that site. It's interesting to see how we used to eat. Even looking at my mom's old cookbooks, from the 40s and 50s, the meals are so different than how we eat now. 2cute, I will put your nephew on my list, as well as the rest of your family. Have a great day everyone, enjoy the spirit of the holiday season. I am giving up STRESSED .... it has that opposite affect on me... DESSERTS. I am ashamed to say how much weight I have gained in the last 3 weeks. I have got to STOP IT NOW !!!! There won't be for a while ... at least not until January ... but I will try to peek in regularly and post something. P.S. Lilion... loved your tree. I hope more of you post yours. I know I didn't do the other two verses, but I didn't think of that until I had done that verse, so there it stays. LOL! I am not doing so good with the challenge either 2cute, as a matter of fact I have probably gained a couple of lbs also. I am not standing on that scale to find out. Call me a coward! I am trying to keep myself sensible It just isn't working too well! Terri, Thin, Michelle, come out whereever you are, you too Barb. I know it is busy season, but come say hello! Leanne, I hope things are looking brighter for you now. Marge, Hi! I hope you don't have to go anywhere with that mess you have in NY right now. (transit strike) I was watching the news earlier and what a mess of traffic! Christmas is getting closer! And an end to the all the eating and no-exercise! I certainly have not lost to my goal but I haven't gained much either. We had one of the neighbor couples over on Monday. The other couple couldn't make it and in the end, I'm glad it was just the four of us. I was late to my own party because of work and three bad traffic jams. But they didn't care. We just had snacks and drinks. We made killer chocolate martinis. Good thing we weren't driving because they were potent. We did a lot of laughing. He plays guitar and writes songs so she got him to go get it and play for us. That was so much fun because he's really good. So even though we were drinking alcohol calories, we didn't have all that much food calories because we really hadn't expected they would stay until 10:30. We had a holiday luncheon at work on Monday. My mean old "B" of a boss really pulled out all the stops and gave the department a very nice "thank you". Lots of good finger types foods. She gave away a lot of gifts. Not that any of her direct reports got anything. We got to serve the department food and drink. I've done something to my right hand. I'm not sure if its carpal tunnel or something else. I remember waking up several times last Friday night and my hand being asleep because I was sleeping on it or something. Then all day Saturday it really hurt in the heel of my hand up through my two middle fingers and down into my wrist. I've been wearing a wrist brace thinking its CTS but its still sore. It makes it twinge to type. So it might be a tendon issue? I'm not sure what type of doctor to call to see what to do. Any thoughts? Tonight is dinner with DH's oldest son and his wife. They invited us down so that takes care of Christmas with one of his sons. The good thing about this son is that he really isn't into family gatherings or making a big deal about things like that. No pressure to make wonderful events for him. The bad thing about him is that he isn't into family gatherings. So if you don't intiate, you don't get to see him. He's a good son though and I know if we ever needed him for anything, he will be there. I'm not sure what we're doing with the other son. Since he ruined our van and never paid for it and we always have to provide all the food for getting together, I thought we'd wait to see if they want to make some effort in having a relationship with his dad. We'll call by Friday to see what they want to do about getting together. But I think its time for him to make some effort here. He is 37 after all. I just know after the chaos and bickering of having them at Thanksgiving, I'm not doing that again for Christmas. We're seeing them separately. I took my last PTO day yesterday. We went out to breakfast and then over to Nebraska Furniture Mart. Absolutely huge. We finally bought a new TV stand for our big TV. I should take a picture of the ridiculous stand we've been using. Its one of those things we knew we needed to replace because its a 32" TV but just didn't get around to doing it. We also bought a home theater system. We'll be able to blow the windows out. DH is not electronically inclined so I get to figure out how to hook it all up. Plus we we're going to have to have help getting the TV moved to the stand. He and I can slide it off onto two coolers so that I can change the stand but not sure if we can go from the coolers to the stand. Might have to have my brother stop by. We also went to see King Kong. I liked it and DH thought it was a bit far fetched. Far fetched? Serioiusly, its King Kong, how realistic should it be? I thought the filming was excellent and yes it was a bit ridiculous in places. Like climbing up to the top of the Empire State Building. But a good fun CLEAN movie for a change. Marge - Wow, I just saw NYC on the Today show. What a mess. I haven't caught why there is a strike though. I'm glad you don't have to get out and fight to get to work. Think of all the poor tourists who are there for a holiday trip. Lilion - Love the tree. I have an angel topper very similar. And I have the Rodney and Rhonda reindeers from years ago. Don't beat yourself up about the food. Don't let it be an excuse to go wild but just enjoy the season because you can get right back on program. to everyone else! Yes, Valerie is definitely missing. Come back! Okay, I have to go get dressed and off to work. I work today and tomorrow and then off for four days! Checking in, again no time to sing. Last night I took DS#2 with me and bought oleAlvin a car. He's been driving a leased truck with 600 a month payments, and we decided that we couldn't handle that anymore, so we turned it in and bought this 2002 IMPALA. I don't think I've ever owned a Chevrolet, but it seems like a nice enough car, really roomy, and the best thing is that it's paid for!!! So it's off to work, I'm working all week as I don't have a reason not too. Boring life huh??? Hope everyone else has a great week.